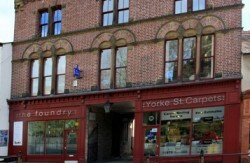 We're in The Foundry on Yorke Street, in Wrexham. With High St on the doorstep and Eagles Meadow shopping centre just around the corner, there's plenty of space to stretch your legs and lunchtime options to keep you fuelled all day. This space has printing facilities, including photocopying and A3 printing, and the usual unlimited tea and coffee as well as Wifi, meeting rooms and rooms perfect for training days. Welcome to Indycube Wrexham; Please use our book a desk button to arrange a visit. We hope you enjoy the space, please make the most of our free Welsh tea, coffee and WIFI.